If you wish to cancel an order, simply contact us. We will refund the cost of the order and the original delivery charge. If the goods have already been dispatched, you will need to return them to us at your own cost. You can return products (except for those marked as exceptions) for a full refund if you return the item(s) to us within 14 working days of receipt. Provided you return the full order, we will refund the original delivery charge paid. The cost of returning the item(s) is, however, at your own cost. Returned products must be in their original packaging, with instructions and all parts included, in a fully resaleable condition. Items must not have been used or assembled in any way. Ma Maison Algarve reserves the right to refuse a refund on any item not deemed to be resaleable or if any of the above terms have been breached. The refund will appear on your statement within 14 days of the goods being received into our warehouse. Please note: the parcel and its contents are your responsibility until they are received at our warehouse – we therefore recommend that you use a registered postal service and retain proof of postage. Ma Maison Algarve is not responsible for returned goods being lost or damaged in transit. Please ensure the product is well packaged to avoid any damage during transport back to our warehouse, so that the product arrives at our warehouse in a resaleable condition. Please complete the Returns Reason Form found on your delivery note, indicating the item you are returning and your reason for return. Please ensure you include this slip within the parcel – without it, we may not be able to process your return. Use the original packaging to repack your returns, ensuring that the product is packed well enough to avoid any damage during transport back to our warehouse. The product must arrive at our warehouse in a resaleable condition. Re-seal the parcel and take it to the Post Office within 14 days of receipt. Remember to obtain a Certificate of Posting from the Post Office. This is your proof of posting if your parcel goes astray. We recommend you also use recorded delivery or similar, thereby obtaining a unique tracking ID. We will refund the card that you used to purchase your goods. 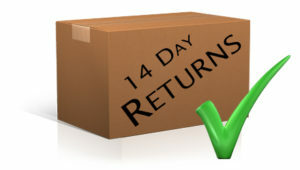 The refund will appear on your statement within 14 days of the goods being received into our warehouse. If your item was faulty or damaged on arrival, please contact us within 48 hours of receipt and we will arrange to collect the item, and organise a replacement where possible. I have received a faulty or damaged item. We want all of our clients to receive goods of the highest quality, so if your product is faulty or damaged on arrival, please contact us with details of the issue within 48 hours of receipt. We will arrange to collect the item from you and, wherever possible, we will endeavour to organise a replacement item for you. Can I return an item for a replacement? If you return a faulty item, we will do our best to contact the supplier and order you a replacement. As we do not hold stock ourselves, replacement items can only be provided subject to availability. If we cannot replace the item within reasonnable time, we will refund the cost of the item. The refund will appear on your payment card statement within 14 days of the goods being received into our warehouse. Bedding, Towels, etc. (All items in the Category Soft Furnishing) once the original packaging has been opened. Items that have been personalised for you, such as made to measure products such as sofas, furniture and fabric cut by length.